BubbaBeads – The Ultimate Baby Fascinator! BubbaBeads aren’t pretending to be anything that they’re not. What they are is bright, colourful, fun and interesting to children. What they will do is keep your baby fascinated, calm and happy during feedings. 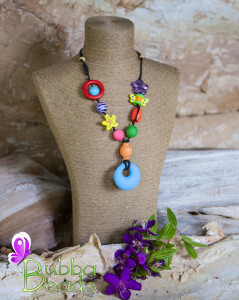 With a mixture of beads in different colours, shapes and textures; a removable silicon teething pendant; adjustable length; and a break-away clasp, they are designed to keep your little one safely entertained for hours. BubbaBeads are a unique, hand made, fully customisable wearable sensory experience, with bold and colourful designs that will capture your baby’s attention, and stimulate them to look, touch, feel and explore. It’s a traditional solution for the modern Mum! Nursing necklaces reduce distractibility and encourage a sustained nursing session. Babies become so absorbed in exploring BubbaBeads that Mum and Bubba are able to enjoy calm, happy breastfeeds. The Teething Ring: With a soft matte finish, this teether is great for soothing sore gums. The silicon pendant is made from FDA approved, food grade silicone, free from BPA, PVC, cadmium & lead. It is designed for little fingers to grab instinctively , and helps improve fine motor skills. It is a non-toxic alternative to regular costume jewellery, and can be washed in warm soapy water or the dishwasher. The Bead Selection: Bright, colourful, with different shapes and textures. Perfect for fiddly, twiddly little fingers to explore! All beads are individually knotted, on heavy duty satin cord. These beads will delight and entertain, and keep those little fingers out of your hair, mouth and nose. Adjustable Length: Easily adjustable while wearing, with no knots or clasps to struggle with. The necklace is 60cm long fully extended, and can be shortened to choker length. Customisations: All of our necklace are one-of-a-kind creations. To make it even more personal you can add a name, a word, a phrase – whatever your heart desires! If you want to really brighten up your necklace you can select to have a brightly coloured cord, too. Teether on the Run – our 2nd product to help Mums on the go. A simple yet safe aid that attaches to your wallet, handbag or keys. Combine a necklace and Teether on the Run and save on the teether postage. If you do just want the Teether on the Run, you will need to apply the Shipping Discount ‘Teether on the Run’ at checkout. Transformer Bubbabeads – Turn your nursing necklace into a piece of costume jewellery by choosing from our range of costume jewellery pendants. Please note that all necklaces and teether products are custom made to order. Unless Express Post is purchased, please allow 5-10 days for delivery. Thank You! 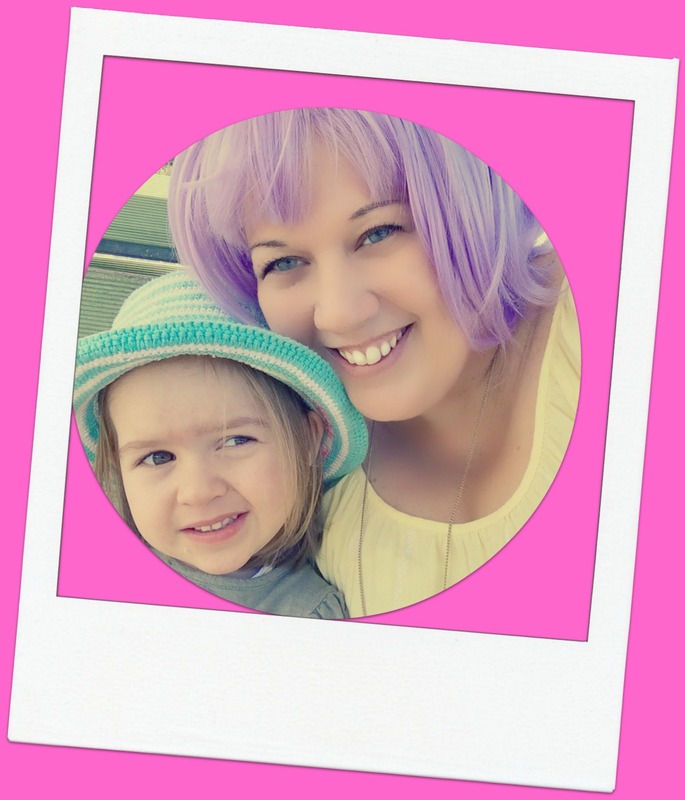 BubbaBeads was created by Kellie Walker while breastfeeding her daughter Cadence. BubbaBeads is a wonderful product that helps keep those fidgeting hands busy and active minds entertained whilst mum gets to juggle with a lot more ease. Designing with love and commitment to both safety and ascetics, Kellie has created a product that is not only practical but also thoughtful and unique, so if you’re a mum yourself and need some help wrangling your little one during breastfeeding, or you’re shopping for a great gift idea then BubbaBeads to the rescue. Unfortunately Kellie, my beautiful, brave and much loved daughter lost her battle with cancer on the 10th April 2016, leaving behind her loving husband Luke and 3 year old daughter Cadence. It is my intention to continue supplying Kellie’s lovely necklaces as part of her legacy with all profits going into a trust fund for Cady. I hope that one day Cady will take on the manufacture of her Mum’s BubbaBeads knowing she was her inspiration. I undertake to continue her high product standard and attention to detail.